I found an interesting curry and rice. You use milk to make this curry. It has a nice creamy taste and spicy flavor. I used to live there for 6 years. 1 box = 100g (3.5oz.) 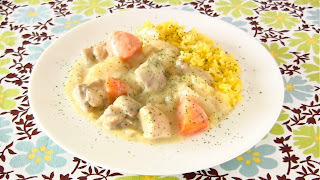 House Hokkaido White Curry Sauce Mix *we call it "curry roux"
1. Cut meat of your choice into bite-size pieces. Cut the onions into bite-size pieces. Cut the potatoes and the carrot into bite-size pieces. 2. Heat the cooking oil in a large stew pot. Add onions, carrots, potatoes, and meat, and stir-fry them until slightly coated with oil. 3. Add 500ml water, bring to a boil, remove the foam, and turn the heat down to low and cook for about 15 minutes. 4.Turn off the heat, break up the curry roux into the pot, and mix well until completely melted. *make sure you stop the heat when you add the curry roux, otherwise it won't blend well. 5. Then put on the heat and simmer for about 5 minutes until it thickens. 6. Add 200ml milk, then simmer for another 5 minutes to finish. 1. Wash the rice with cold water. Put in the rice cooker pot, then add water to the appropriate level indicated in the pot. 2. Add the turmeric powder, mix well, and start cooking. 3. Serve curry on a hot bed of turmeric rice. *for best results, don't use a lid while cooking.